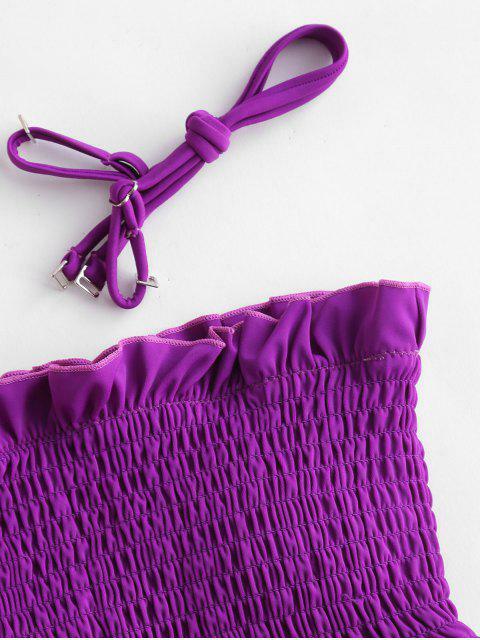 [22% OFF] 2019 ZAFUL Ruffles Braided Smocked Bikini Set In DARK ORCHID | ZAFUL .. Comfortable and of fantastic material l, True to size ,Looks exaclty like the pictures ,Super cute ,Fits well ,Love it . I love the style and quality. I’m 145 and 5’7 and ordered a medium. I’m usually a small in top and medium in the bottom but the top fits super cute. Honestly could wear the top as a crop top with jean shorts. Love it so much and will order more! The smocked detailing creates pleats and puckers the fabric, it has two options to wear as a trendy bandeau top or classic spaghetti straps style and trimmed with delicate ruffles, and the matching bottoms are detailed with braided straps and cutouts at the sides for a flattering fit.